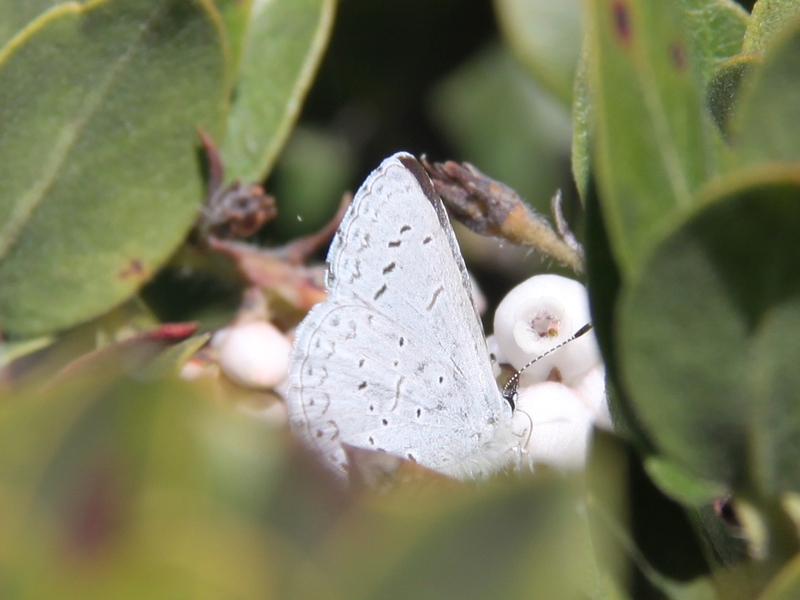 The family Lycaenidae contains mostly small butterflies commonly known as Blues, Coppers, Hairstreaks & Harvesters. They are mostly small. Many are rare many of them very rare. Most species are blue or brown colored with delicate, streaked markings, hence their common name, ''hairstreaks'' (Theclinae). Others are copper colored and popularly called ''coppers'' (Lycaeninae). Some characters of adults: antennae usually banded; eyes of adults indented near antennae and face is narrow; forelegs of males reduced, with fused tips without claws; forelegs of females ''of almost normal size'' and do bear claws; radial (R) veins of forewing simple, not forked; hindwing often with thread-like extensions that resemble antennae (typical of ''hairstreaks'') coloration often bright, iridescent. North American taxonomists traditionally divide our species among four subfamilies: Hairstreaks (Theclinae), Blues (Polyommatinae), Coppers (Lycaeninae) and Harvesters (Miletinae). The first three of these are very closely related, and taxonomists in other parts of the world commonly consider them as only three (among several) tribes under the subfamily Lycaeninae; while certain other more distinctive groups (including Meletinae) are treated as full subfamilies. The small blue species are simply referred to as “blues” (Plebejinae). The life cycles of many of the blues, especially members of the genus Plebejus, are very complex and involve interesting relationships with ants. Myrmecophilous species include: Glaucopsyche piasus, G. lygdamus, Lycaeides melissa, Plebejus acmon, and P. icarioides. A number of species are parasitic or predatory. Family Lycaenidae - Blues, Coppers, Hairstreaks, Harvesters. (http://bugguide.net/node/view/194). Accessed March 12, 2016. .